What Would Life be Like if You Knew You Were an Immortal Spiritual Being? “It is my viewpoint that each man has his own unique magnificence regardless of race, religion, nation, tribe, station in life, customs and beliefs…,” so writes poet, Louis Alan Swartz. 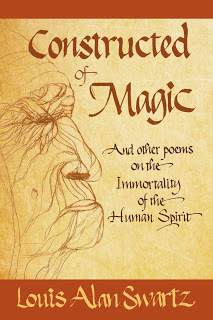 Constructed of Magic and Other Poems on the Immortality of the Human Spirit is a refreshing collection of poems that explore the beauty of who we are as spiritual beings. Our ability to love, dream, create futures, even die with dignity are all part of who we are and why we are here. These poems don’t pretend to give final answers to any of the big questions about life, but they do help us to look and come to our own understanding. “This book is a testament to the poet’s vision-an understanding and appreciation for the spiritual and aesthetic nature of mankind….There is a peaceful calmness that cascades over me when I read the joy that Louis Swartz communicates in these poems. I invite you to share that experience with me.” Bernard Percy Educator, Speaker, Author. Due to the fact I am an English Literature student I am no stranger to poetry and this certain collection of poems did not disappoint. Many of them were interesting, compelling and left me pondering perplexing thoughts and some definitely pulled on my heartstrings. This made the poems really easy to read and digest. The book was also scattered with drawings throughout, which I absolutely loved! It added extra meaning to the poems and forced my imagination to explore the beauty of the words. At some points while reading the poetry I truly lost myself, fully immersed in the eloquence of the words. I would recommend reading these poems because they are full of exquisite imagery and magnify the the importance life.